Fantastic news! We have agreed the date for our next quiz night. It is 7.30pm on Friday 20th May 2016. If you'd like to buy tickets our preferred payment method is a transfer of money direct to the Friends bank account ( Lloyds 30-93-55 01464461 - Please include your surname and your your child's class number ). As always these events only take place through the efforts of the volunteers who give their time and because of the sponsors who kindly support them. Included in the ticket price is some fantastic food which is being prepared Yasmin at Layla's Kitchen. As always the Quiz is open to anyone so we really hope to see you there. We also welcome any enquirers about volunteering on the night or from any local businesses that would like to know more about sponsoring. 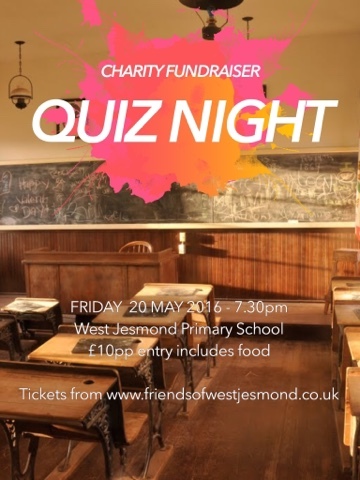 Please email us on info@friendsofwestjesmond.co.uk and we can provide details. Alternately you can text the organiser Martin Wardle to arrange tickets and payment.